The name topaz comes from the Sanskrit word, tapas, which means fire. Did you know topaz is actually near colorless or white? Through natural or man-made heat, the stones can come in a variety of colors. Alongside blue being the most popular color, topaz is also available in pink, yellow, red and several other color variations. In ancient folklore, the Greeks believed topaz had the power to increase strength and make the wearer invisible, while the Romans believed it had the power to make ones eyesight better. We’ll let you be the judge of that! Also known as the Jewel of love and loyalty, the gemstone represents eternal romance and friendship. 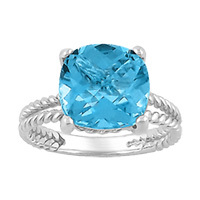 Gifts of topaz can signal a wish for a committed relationship or even appreciation of loyal friendship. December is also known for two other alternative gemstones: tanzanite and turquoise. Both are different but are also available in shades of blue! So if you’re celebrating a birthday, friendship or just searching for a holiday gift, take a look at December’s birthstone, blue topaz. The dazzling blue hue will take your breath away! Celebrating 40 Years in Fashion! Featuring the Pin To Win Contest!